Blog Quick Quotes: Bling It On - Day 2! Bling It On - Day 2! Welcome to Day 2 of Bling it On Inspiration Week! 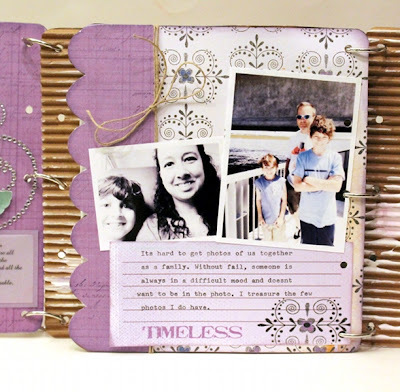 Quick Quotes and Want2Scrap are teaming up to bring you lots of fabulous projects! Happy Tuesday to you! Wendy here this morning to share my project with you. I was excited to open up my package and see that I would be working with the Corrugated Waterfall Album! I love the corrugated album, but I wanted to see if I could mix it up a bit. As I was laying out my pages, I realized that if I flipped two of the pages, it would work as a gated album. All that I had to do was punch holes on the back panel on the opposite side. I lined it up with one of the other pages and marked where to punch the holes. 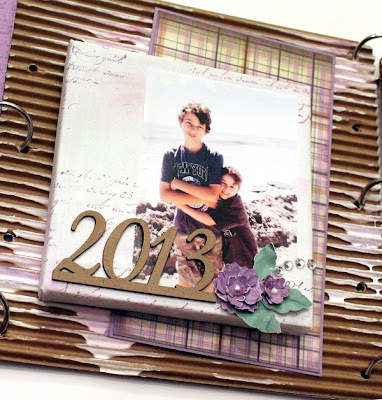 I finished the cover with Quick Quotes pattern paper and added a bit of stamping with PowderPuff Chalk Inks. 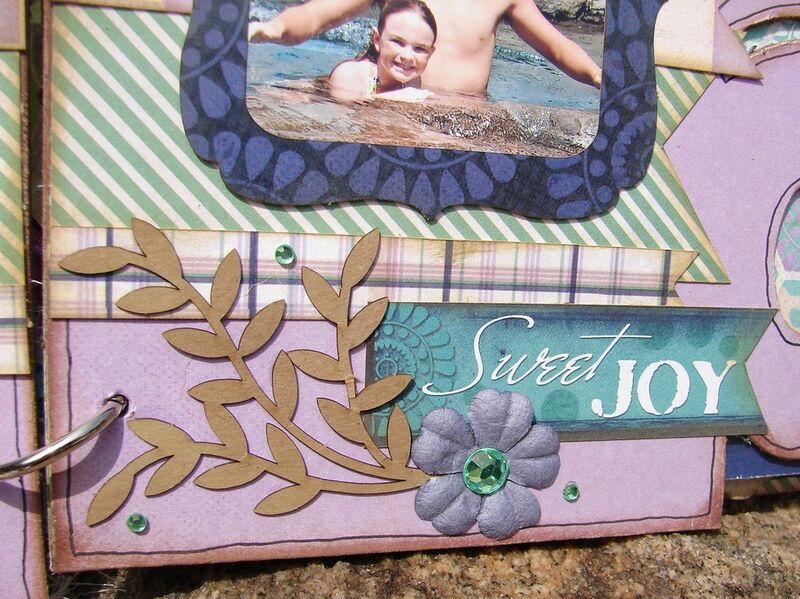 I added one of the Want2Scrap Rhinestone Flourishes and a few handmade flowers. 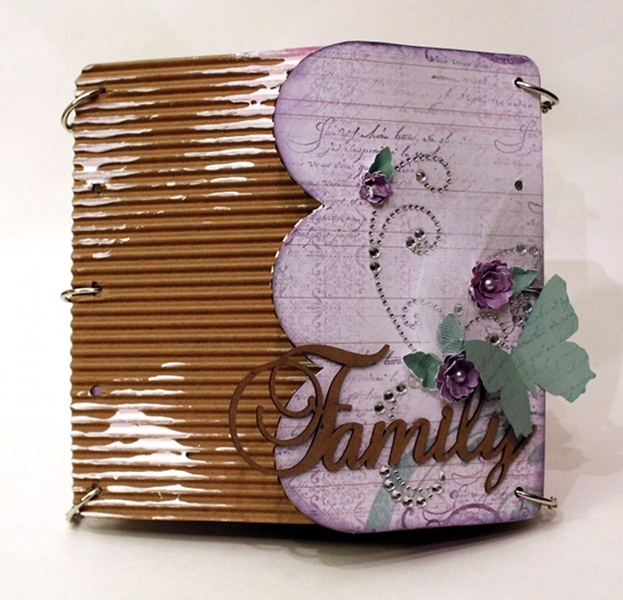 A chipboard Want2Scrap "Family" embellishment completed the cover. I covered the flat sides of the pages with Quick Quotes pattern papers. I spread Gesso randomly on the corrugated side. When it was dry, I dabbed PowderPuff Chalk Ink on the Gesso and spread it with a damp paint brush. For the back cover, I painted a canvas with white paint. After it dried, I swiped some PowderPuff Chalk Inks randomly over the canvas and quickly spread the color with a damp brush. It gives just a faint hint of color to the canvas. I added a bit of stamping to the canvas. Hi! 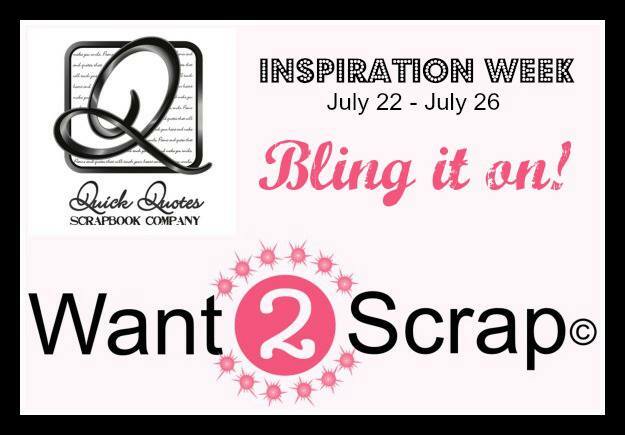 It's Barb and I am so excited that Quick Quotes has teamed up with Want 2 Scrap this week!! 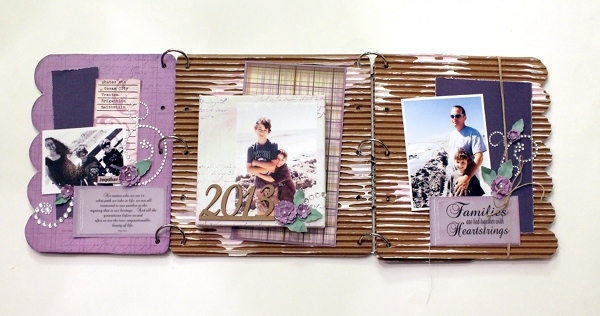 I was sent the most adorable Beach Mini Chipboard album to create with along with all kinds of bling!!! I couldn't wait to get started! Since I was given bling in greens and purples, I decided to use the Dusty Road Line from Quick Quotes to make my mini! I love the color combination in the Dusty Road line. 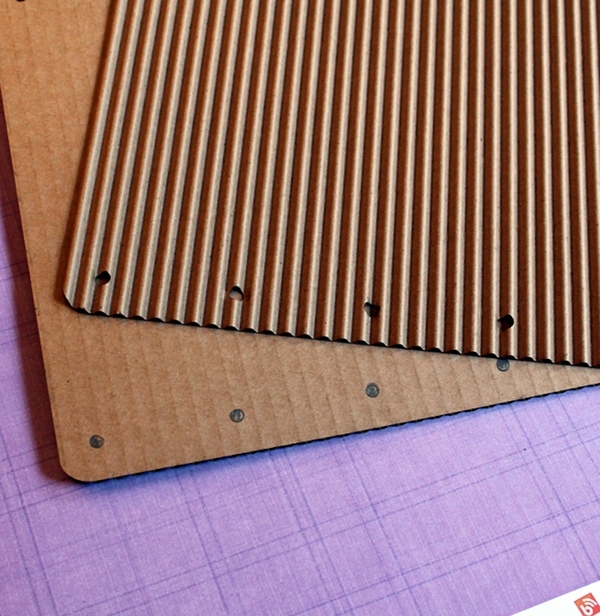 It was perfect for covering the chipboard in this album. The way this album is designed, with each page extending a little further than the one before, you can really see all the beautiful patterns. I covered each of the pages, inked around them with Mocha Mama PowderPuff Chalking Ink and then outlined them with a black pen. I used the Want 2 Scrap bling on the cover of my mini. The flourish adds a nice amount of sparkle and the bling was perfect for the centers of my flowers! 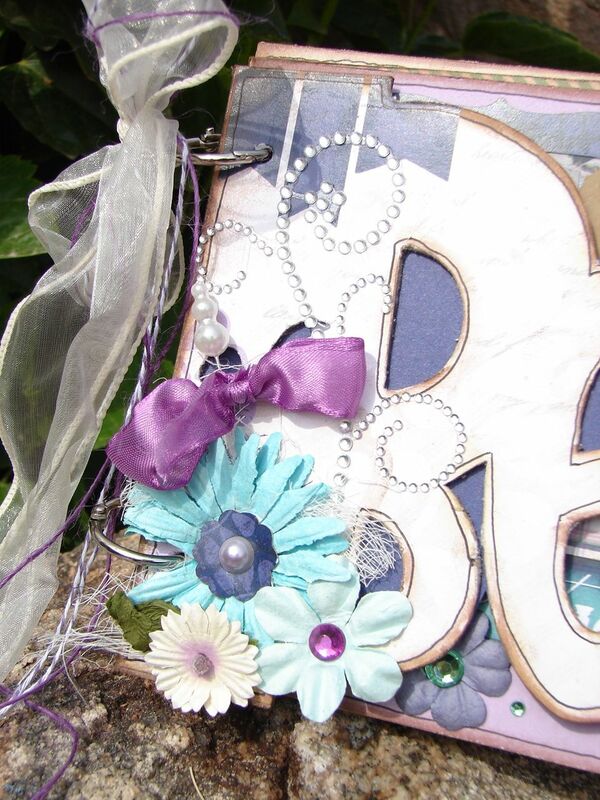 The beautiful stick pin with the purple bow is also from Want 2 Scrap. 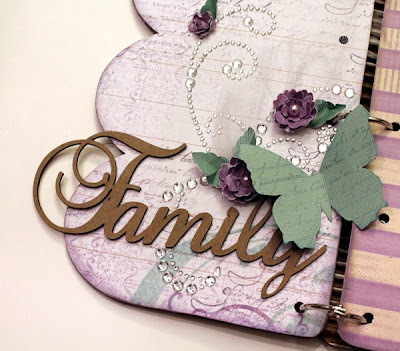 I had a few chipboard pieces left over from one of my Club Q kits so I used that along with the sentiment I cut from the 6x6 Dusty Road Paper Pad. I fussy cut some of the circles from one of the Dusty Road papers and then added some Want 2 Scrap pearls to make the embellishments on this page. And I finished it all off with some of the sentiments cut from the 6x6 Dusty Road Paper Pad and the Dusty Road chipboard stickers! Thanks for spending some time with us here today! What did you think of Bling It On Inspiration Week - Day 2? Wendy and Barb, your mini albums are so gorgeous. I love all the techniques you tried, just beautiful! Two of the most beautiful mini books I've ever seen. Love how each of you used the Want2Scrap bling. So inspiring! Wendy love what you did to the album but turning it into a gatefold and Barb, love the Beach album and all the added details. Wow, wow, wow! Beautiful mini-albums ladies! 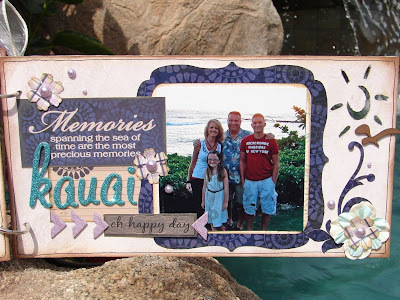 Wendy - love how you turned it into a gated album and adding the canvas was brilliant! Barb - the way you finished the "Beach" album is right up my alley. 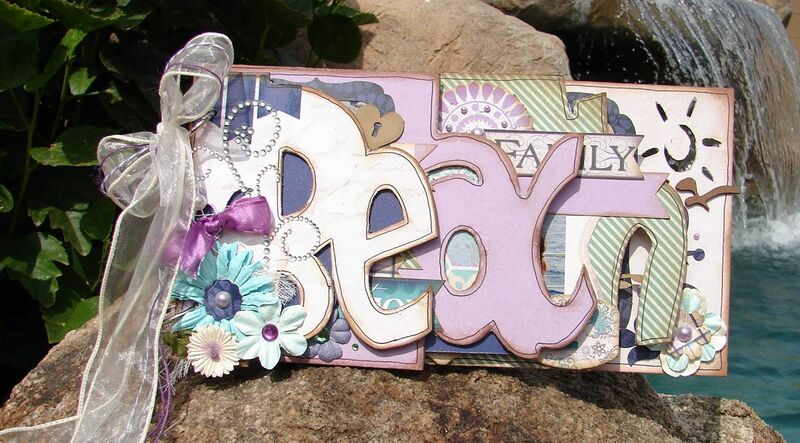 Each page is so beautiful, and something a simple as outlining the letters really makes it "pop"! Great job! Great beach mini, I love the color scheme. 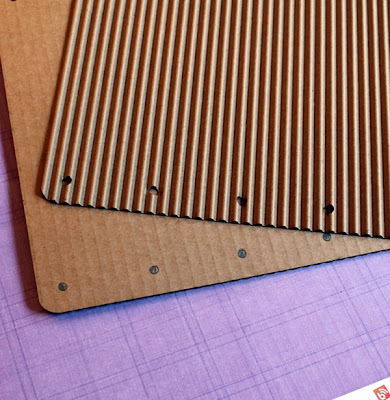 The gesso on the corrugated cardboard always looks so cool to me! Jen and Kate, everything is fabulous. Great job! Such beautiful albums. Love the attention to detail. Both albums are great! The corrugated album is my favorite! 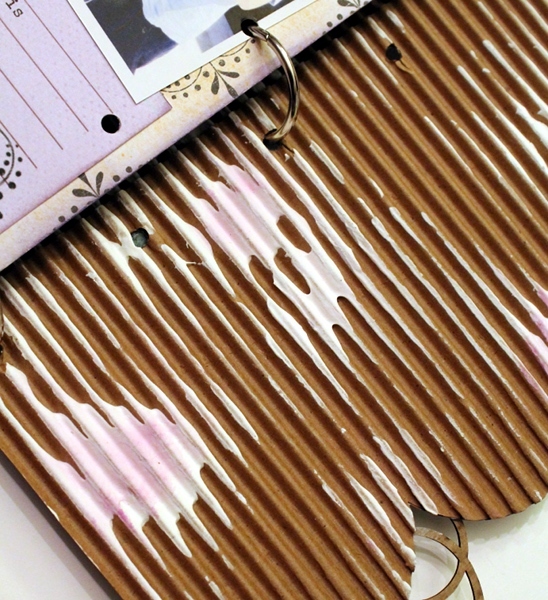 I love the effect of the gesso with the chalk ink. Beautiful! Great projects! I just got the Dusty Road collection, and really needed the inspiration! Like the beach album with all the cool detail. Great projects! Love all that texture!